I don’t usually repeat a knitting pattern too soon after having done it once, but I really liked this one and wanted one for myself (or rather my baby) after gifting the last one to a coworker. 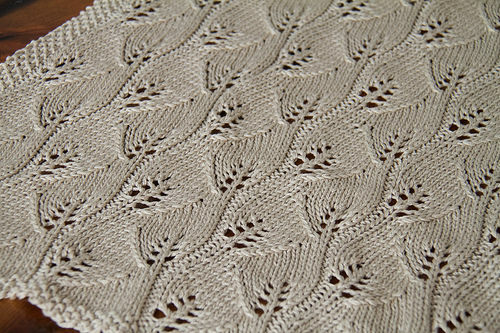 The pattern is Leafy Baby Blanket by Leyla Alieva, only this time I cast on 145 stitches, which is 9x the width of the leaf lace chart, instead of the 6x repeat the pattern calls for. 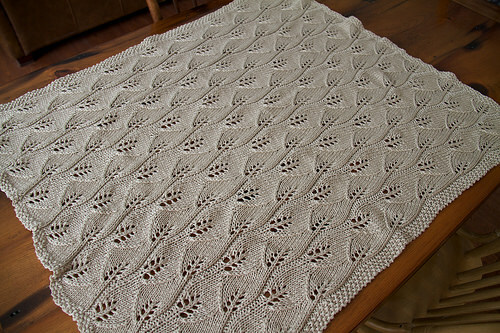 I also knitted 9x the repeat of the chart for length. It’s a really great pattern that’s not to difficult to do, and this mercerized cotton (Paton’s Grace) is luxurious but easy to wash and hard wearing. For the bind off I wanted something that looked more integrated into the pattern, so I tried out Elizabeth Zimmerman’s sewn bind off. I think this is my new favourite bind off. It makes the bound off edge look much more like the cast on edge, while still being really nice and stretchy (not so essential for a blanket but it can be very useful for lots of other bound off edges). Tutorial below. This blanket will be good for travelling around in the stroller or lounging about on the floor. Unfortunately I was reading recently that blankets with lacy holes can be a problem for small babies to get their little fingers or toes caught in, so that was kind of a bummer. But you don’t leave a baby with any kind of blanket on unsupervised anyway so I’m not too concerned. I’m sure we’ll have many uses for it for years to come.